Russia on Tuesday held funerals for three journalists killed in the Central African Republic who were investigating a shadowy Russian mercenary group for a media project founded by Kremlin foe Mikhail Khodorkovsky. The three men, reporter Orkhan Dzhemal, director Alexander Rastorguyev and cameraman Kirill Radchenko, were killed on July 30 shortly after arriving in the war-torn country to report on a private army known as Wagner Group. Wagner's soldiers have fought in conflicts in Ukraine and Syria, according to Western and independent Russian media reports as well as foreign governments. Russia officially has military and civilian instructors in CAR to train local troops and experts have suggested they could be part of Wagner. The Russian foreign ministry said initial evidence suggests the journalists were killed after resisting robbers. The men's bodies were flown to Russia on Sunday. 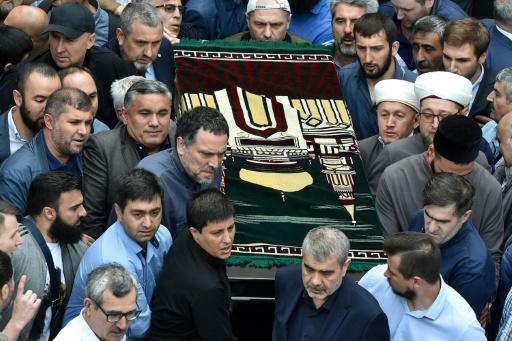 The body of Dzhemal, a 51-year-old journalist and war correspondent who had worked for media including liberal newspaper Novaya Gazeta, was laid out in the courtyard of Moscow's main mosque for prayers with around 300 mourners, ahead of his burial in a city cemetery. Dzhemal's youngest son gave a moving eulogy. "If there were a few more people like this in the world, the world would be a lot better. I will try to be as great as my father," Mansur Dzhemal said. The family of 47-year-old director Rastorguyev, whose documentary films including "Tender's Heat. Wild, Wild Beach" picked up international awards, held a funeral service in a Moscow Russian Orthodox church. "His films are absolute works of genius," Lyubov Arkus, a documentary maker and editor of film magazine Seance, told AFP. She called him an "uncompromising radical" for whom "meaning was more important than career." The family of cameraman Radchenko held a private memorial ceremony for the 33-year-old who had spent months covering the Syrian conflict for pro-Kremlin outlet ANNA News, but himself held opposition views. The trio were sent to Africa by a centre for investigative journalism set up by Khodorkovsky, President Vladimir Putin's arch foe who lives in exile in Britain after spending a decade in jail. A journalist at the centre, Sergei Kanev, told Echo of Moscow radio he believes Russian investigators want to pin the blame for the men's deaths on Khodorkovsky. "I suspect all the arrows will be fired at Khodorkovsky, that he allegedly sent people to certain death," Kanev said after being questioned by investigators. Russia has opened a murder probe and its investigators are questioning the dead men's colleagues and relatives. Mourners carry the coffin of slain Russian journalist Orkhan Dzhemal, who was killed during a reporting trip in the Central African Republic, after an Islamic funeral prayer at Moscow's Sobornaya mosque.